I generally despise "How-To" blog posts. I mean if you know how to pick stocks, then do it and become a millionaire and leave us alone. If you can teach us how to write a bestselling book, then why aren't you a bestselling author? So I pursue this topic with an agenda. I'm attempting to assist writers who might have the ability to become successful thriller writers, but are getting in their own way from that accomplishment. Mind you, each writer has a different opinion of what successful means. To many authors developing a core group of a couple of hundred loyal readers is their goal, and a worthy one at that. Hopefully this will offer some support. The first time I heard someone explain how to write a thriller I was at a writers conference and there was a midlist author explaining her road to publication. As a newbie author I was intrigued with the topic. When she got to the part where she described her ability to conjure up the courage to ask her roommate to look at her manuscript, I was on the edge of my seat. Until she mentioned that her roommate was an agent with the Curtis Brown Literary Agency. That's when I threw up in my mouth and left the room. The title of the seminar should have been, "How to find a literary agent roommate." My experience is a little more grounded. I began my writing career with short stories. It took a while to get noticed, but after three years I had five stories published in literary magazines, two of which were nominated for the prestigious Pushcart Prize. It was this form of acceptance which gave me the confidence to move on to novels. I personally enjoy reading action thrillers. Something to keep me intrigued while the tension seemed to mount with each passing page. I became a fan of Nelson Demille, the late Vince Flynn, and Elmore Leonard, among others. After a while I noticed a pattern among these writers. They kept the pages turning with minimal exposition. There's a famous quote by Elmore Leonard: "Try to leave out the part readers tend to skip." This is exactly where I'm taking this post. Readers have a wide variety of tastes. The important aspect to growing your core is to tap into the exact taste your readers are looking for. This is It's especially important when describing your book as well. Here's why this is important-- If you took a date to a white tablecloth restaurant to celebrate a special occasion and found nothing but hot dogs and hamburgers on the menu, you would be disappointed. Mind you, these might be the finest hot dogs on the planet, but that's not what you were expecting. Well, readers have tastes too. If you're a romance writer and you're skipping the description of the protagonist's well-built body, then you're missing the important part of the journey for the reader. The opposite goes for thriller writers. Does anyone know what Jack Reacher looks like? Not really. All we know is that he's big. That's about it. And his size is important to the overall theme of the storyline. But for the most part thriller readers want the action. They want tension. They want speed. If you're a thriller writer and you're spending a couple of pages describing a field of daisies blowing gently in the afternoon breeze, their stems better be attached to sticks of dynamite. I've heard a rather famous author once comment very disparaging about a well-known thriller writer who left a lot of white space on the page. As if this was beneath a good writer to use dialogue to express the character's motives. Compression is a valuable art form in this genre. The temptation to describe the protagonist's eye color as she walks in front of a mirror must be resisted. This doesn't mean you can't stretch out scenes for pages to describe an incoming plane with a terrorist prisoner on board the way Nelson Demille did with the opening scene to The Lion's Game. That scene was so tense I couldn't get through it fast enough. By the way, that was a 900 page book and it was too short. The final thing I'd like to say about writing thrillers is simple: Start with the action up front. I've read so many thrillers where the author feels it necessary to give you a laundry list of the protagonist's past history so the reader will care about him or her. Believe me, if the protagonist is hanging upside down from the wing of a plane, all you need to do is mention that he's thinking about his daughter becoming an orphan and the reader is hooked. We care. Now get him out of there so we can flip those pages faster. Let me give you an example of how the importance of first lines have escalated over the past few years, especially for an Indie author who doesn't have the luxury of a brand name to keep the readers getting through a slow first chapter. My first thriller, A Touch of Deceit begins with the line: There was a time when Nick Bracco would walk down Gold Street late at night and young vandals would scatter. Not bad for a start, but still not the best. That was three years ago. I did a much better job, however, with the sequel, A Touch of Revenge. It begins: The bullet left the sniper's rife at 3,000 feet per second. Much better, huh? Especially when that bullet is headed directly at Nick Bracco. 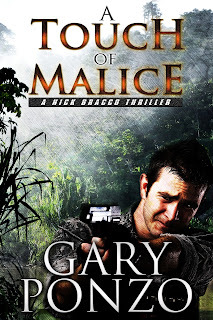 My latest thriller, A Touch Of Malice, begins: The pit viper slithered up the side of the tree and paused to glare at Trent Merrick with sinister eyes. I'll bet that'll get you to read the next sentence. And really that's what this entire post is about—start fast, and keep the action up with minimal need to describe the scenery at length unless that scenery is going to have some value to the storyline. That sunset over the mountain better have the glint of a metal flashing or I'm snoozing through it. How did I learn these traits? From the masters, Vince Flynn, Daniel Silva and Tess Gerritsen. Read them. Study them. Then create your own world using their techniques. I promise it will be a much faster trip. And a much more rewarding one as well. FYI: I owe much of my success to my ex-literary agent Robert Brown (a prince) who pushed and shoved me into becoming an Indie author and Joe Konrath who opened up his financial books, allowing us to peek inside and see just how far hard work can take you. Almost a hundred thousand sold copies of my Nick Bracco series later I am forever grateful to those two. Joe sez: Congrats on your success, Gary. First lines are so important they often are responsible for a reader buying the book, or not buying it. So many ebook readers download samples, and if you don't hook them immediately, they don't buy. 3. Back jacket copy. (your book description, as used on your book's Amazon page. This is because people buy or sample ebooks and forget what they are. Remind them at the front of your ebook. And speaking of first lines, here are a few of mine. What are some of your first lines?